The Arvy threat worsens each day. They continue to destroy the hive's vital fuel resources, leaving us with one option - evacuate to the largest government bunker, located in South Dakota. The injured hive members are moved as first priority, but a disastrous event occurs on the way to our drop-off zone. We find ourselves in a ghost town, surrounded by spiteful, revenge-filled Arvies. Chaos ensues and our death toll rises. Just when we think the end has come, unsuspected help arrives. We are rescued and brought to an underground bunker. With no way of reaching outside help, we must depend on each other to reach our pick-up zone, thirty miles away. If we don't make it in time, we will be left for dead. ©2014 Cameo Renae (P)2014 Audible Inc.
Read the first book AV3 and had to get this one. I enjoyed the characters and story line. It's about surviving day to day (fiction or real life). That friends and family are important and how they can impact our lives in a positive way. The performance of the orator was excellent! I have a hearing issue and need people to speak clearly not loudly! She did a wonderful job! Thank you. Wow! This keeps you on the edge the whole time. I felt all sorts of emotions and I was heart broken for a character I loved. I definitely recommend and the audiobooks!!! What did you love best about Sanctum? It was great to have a whole book in which Abi and Finn could be together. It was very enjoyable. 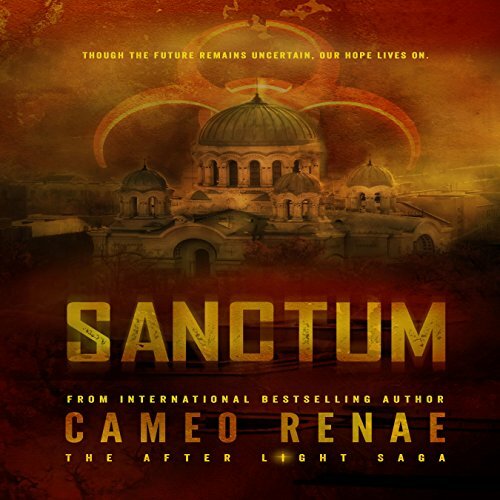 What other book might you compare Sanctum to and why? Seeress, by Ednah Walters. Raine and the witches have to battle the warlocks and evil immortals, Abi and Finn battle the Arvies (alongside the people of Sanctum). Raine has to battle things projected into her mind. Abi has to battle against her mental connection to the Arvies. Raine and Torin grow closer together; Abi and Finn grow closer together. Which character – as performed by Erin Moon – was your favorite? Finn, but then he is one of my book boyfriends. Pike's death. I was unprepared, heartbroken, and I ugly cried. What made the experience of listening to Sanctum the most enjoyable? To me it brought the story the story to life. The edge of your seat feeling as you listen not knowing what was going to happen! I love that! "My name is Abigail Parks and I am a survivor...."
Not a bad story but very mushy love story between to two main characters. much to much spent developing this aspect.